Supply chain network design tools continue to be used by many supply chain leaders not only on a continuous basis to support decision-making in an increasingly complex and dynamic environment, but also for a growing list supply chain problem types. That was one of the clear messages coming out a recent Videocast on our Supply Chain Television Channel with LLamasoft executive Toby Brzoznowski, who did a great job of explaining the many ways companies are using these tools today - creating competitive advantage for themselves in the process, SCDigest believes. From an excellent set of slides, we picked the one below to feature this week. We have reported occasionally on "tax efficient supply chains" - but not enough, and we are trying to rectify that here. 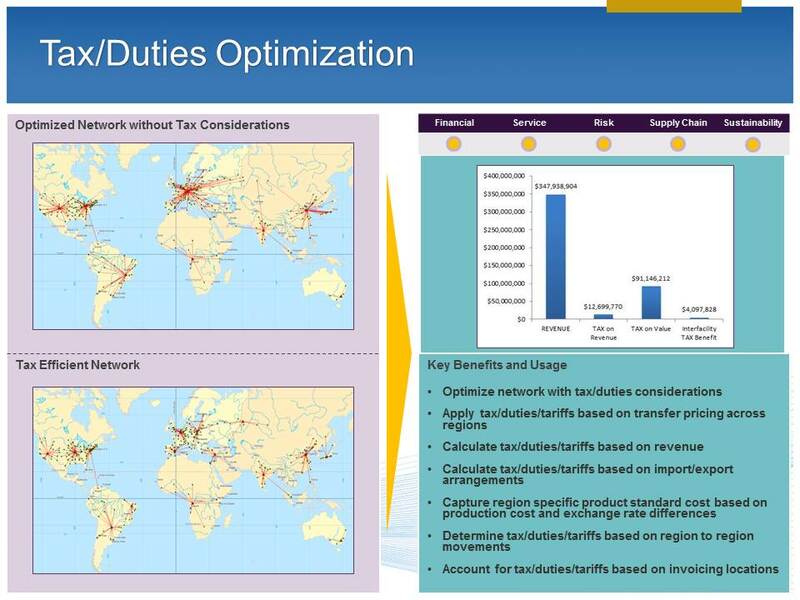 The graphic below, based on data from a real LLamasoft customer, shows what that company's optimal supply chain network and flow paths would look like without considering taxes and duties, and then with those factors included in the optimization run. The details in those changes for our purposes here aren't really important. What is important is that considering taxes and duties/tariffs results in a materially different supply chain design. That suggests therefore that companies not including those variables are often leaving a lot of dollars on the table. With regard to tax efficient supply chains, one challenge in our view has always been that tax considerations are not well understood by supply chain executives, and financial executives who know the abstruse tax impacts don't get supply chain, so it takes a lot of collaboration to come up with the right design. But the relatively few companies that have focused in this area in a major way (such as 3M well back into the 1990s) have almost universally reported significant savings - and major changes in how products move around the globe. But this is just one example of the many ways companies can use supply chain network design and optimization tools. Brzoznowski cited examples including supply chain risk analysis and mitigation, "freshness" considerations, service policy optimization, and several others that extend the areas of decision support well beyond the traditional ways these tools have been used.